For more than 300 years, this Stellenbosch estate has been producing a robust range of reds: full-bodied Cabernets, Merlots, and Shirazes. It has counted some high-profile personalities among its fans: Nelson Mandela had its wines served at his Nobel Peace Prize dinner. These days, Rust en Vrede is perhaps best known for its namesake restaurant, which consistently ranks among the top 10 in the nation. 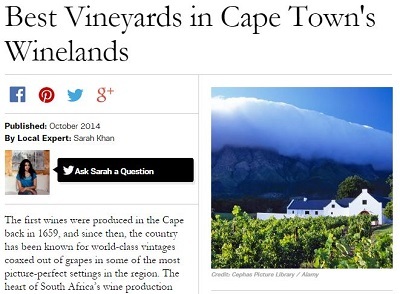 The entire article, “Best Vineyards in Cape Town’s Winelands” is available on the T&L website here. Also see our earlier post about a Forbes article that focused on the amazing Rust en Vrede restaurant.